Network has become an essential part of our daily life. To make life easier, there are various types of network devices on the market, such as such as IP phone, wireless access point and IP camera. Each of them not only has to get access to the network through the Ethernet cable, but also needs power supply via power cord. When the number of devices is a little more, the cabling will be complicated. How to solve this problem? Recently, PoE (Power over Ethernet) technology is popular, which can transmit both power and data through an Ethernet cable at the same time. When it comes to PoE, there are two hot devices: PoE switch and PoE injector. And people often ask: PoE switch vs. PoE injector: which one to choose? This article will make a comparison between them and help you make the choice. PoE Switch vs. PoE Injector: What is PoE Switch? PoE switch is a network switch that has Power over Ethernet injection built-in. When connected with other network devices, PoE switch will detect whether they are PoE-compatible and enable power automatically. Therefore, it is a simple solution to add PoE to your network by using PoE switch. In addition, there is PoE+ switch available on the market. PoE switch utilizes the original PoE standard, IEEE 802.3af, which provides up to 15.4W of DC power to each device. While PoE+ switch use the latest PoE+ standard, IEEE 802.3at, also known as PoE class 4, which provides up to 30W of power to each device. That’s to say PoE+ switch can provide almost twice as much power as PoE switch. The following figure shows a 8-port PoE switch which is popular among many users. PoE Switch vs. PoE Injector: What is PoE Injector? PoE injector is used to add PoE capability to regular non-PoE network links. 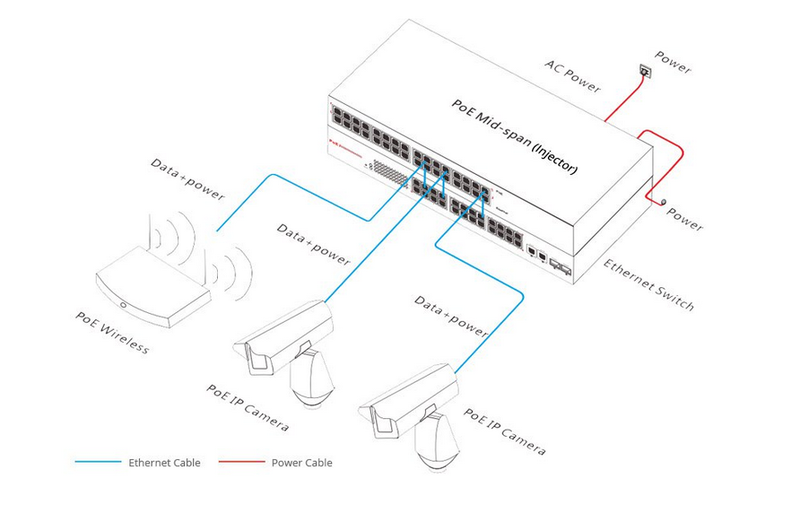 The following figure shows the application of PoE injector. Both PoE injector and non-PoE Ethernet switch are powered on. Then they are connected by an Ethernet cable. By doing this, the PoE-compatible IP phone, wireless access point and IP camera can work through one Ethernet cable respectively connected to PoE injector. In network deployment, PoE injector can provide a versatile solution when fewer PoE ports are required. If you only have a few things to power, then PoE injectors are good. The cost is lower when compared to a PoE switch. If the PoE goes out in a PoE switch, all PoE has the chance of going out. But if a PoE injector goes out, it only affects one device. If you do have to replace a PoE injector, you can just replace the bad injector without any production downtime anywhere else in the network. Both PoE switch and PoE injector utilize PoE technology which makes network deployment even simpler and have their own advantages. It is important to figure out what you need before you make a choice between them. What’s more, please ensure your device supports PoE before connecting into a PoE-enabled network. PoE Switch Vs. PoE Injector, hope this article is helpful for you.